The iconic “swing tree” near Mirror Lake at UConn Storrs is undergoing special treatment to help preserve its health, after experts determined recently that it wasn’t absorbing enough water at the roots. The tree has been home to two wooden swings since about 2010, and has become a popular spot for people who want to relax with friends or jot down their thoughts anonymously in the journal that makes its home in a nearby mailbox. 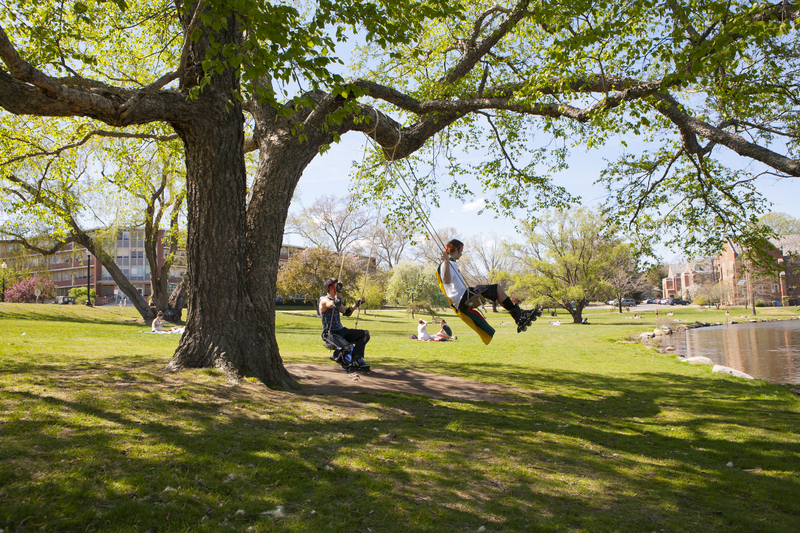 The swings recently were taken down and will be put up again soon on another tree, at least temporarily – with the location still being determined – while experts treat the swing tree’s immediate problems and work on a long-term plan to maintain its health. UConn President Susan Herbst told faculty, staff, and students in her recent welcome-back message that arborists confirmed the tree is sick, and are taking steps to address the problems. Known as a Dahurian birch or Asian black birch, the tree species is native to northern China, Korea, and Japan, and specimen trees usually range from about 40 to 60 feet at maturity, according to the UConn Plant Database. Also known by its scientific name, Betula davurica, UConn’s swing tree is the only known example of that species in this region and is frequently photographed, including when it is lit up during the holidays or as the seasons change. The trees and shrubs at UConn Storrs are among its most visible and vibrant natural resources, beautifying the campus while providing a living laboratory for students enrolled in plant science, biology, environmental science, and other related courses. The Storrs campus is also certified each year as a Tree Campus USA by the Arbor Day Foundation, the first college in Connecticut and third in New England to receive that distinction among a few hundred schools nationwide. The UConn Arboretum Committee, founded in the 1980s, helps oversee the care of the campus trees and shrubs, and manages an inventory of almost 4,300 individual trees. It also produces a brochure to direct people through self-guided tours of more than 30 notable selections, including the swing tree. Mark H. Brand, a UConn Arboretum Committee co-chair who is also professor of horticulture in UConn’s Department of Plant Science and Landscape Architecture, said the Dahurian birch “swing tree” species is rather rare in the U.S. Specimens are usually seen only at arboreta, botanical gardens, and some university campuses. Although the origins of the swing tree are not confirmed, Brand said he suspects the late Kenneth Bradley or his colleagues from the Department of Plant Science might have been involved. Bradley was a UConn professor from 1947 to 1977, and he and others were very active in procuring rare trees from arboretums and other sources to plant on campus. Brand said the tree was already quite large when he started in 1988 and, if it was planted in the 1950s as he guesses, it’s likely close to 70 years old – relatively old for that kind of tree, which is not known for its longevity. 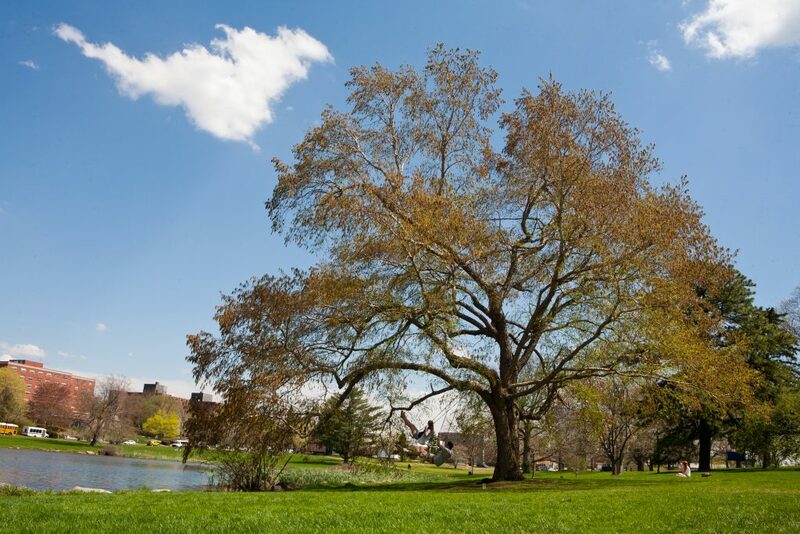 UConn officials noticed signs last spring that suggested the swing tree might have health problems, particularly when the upper portion of its crown failed to leaf out. Although it was first suspected that the damage came from a late frost, the tree started showing more signs of distress over the summer, and UConn arborists were joined by outside experts to take a closer look. They determined the problems were due to water stress, a condition in which it becomes difficult for water to soak down deep enough to reach the necessary points of the tree’s roots. It can occur when soil becomes compact due to heavy foot traffic and other factors. Tree experts are working on a plan that involves treating the soil with an organic soil enhancer and biostimulants that promote tree health and growth, and aerating the soil to better help water reach the critical root zone. Then, they will monitor the tree to see if it follows autumn behavior on the remaining foliage; do another biostimulant treatment next spring; and monitor it for spring budding to see if it leafs out, which will give a better idea of its health.